ginodb 12:20 bread, Egypt, food, Italian, naples, Pizza, Sorrento, South, tomatoes. Ever sat down and tucked into a proper Pizza? The answer is probably no, unless you visit the majestic city that is Napoli (Naples). The food for sharing, the food for talking, the food for watching a match with or film night at home. Symbolically associated with good times, it has its place in the not so good times as well; it's OK, we have all been there! So how did a circular shaped food become one of the world's favourite dishes? A bit of history...Bake like an Egyp-tian...You have to go back to circa 4000 BC, Egypt. Flat breads were part of the staple diet, in fact the whole region brought about the birth of bread as we know it today. The Egyptians created the first ovens, the only environment in which you could cook doughs and then other foods. Then came the Romans, and basically stole the process of how to cook the breads this way. And so it took several men with donkeys to travel to North America...It actually didn't require any man with a donkey, but a whole trading pattern to begin with South America and North America for the cultivation of tomatoes. This in turn was then a food source for sailors and when it was discovered that they could bring back the plants it was around 150 years before they made their way into the popular food culture of big marine cities such as Naples and Genoa. It was going to be another 1000 years, well roughly, 1830 to be precise that the first indoor pizzeria was created, all the rest to that point were street stalls. And such, it became engrained in the history and culture of Naples, as a Neapolitan dish. And so we have to thank a Queen...It was to be 1889 that Pizza became the nations food. 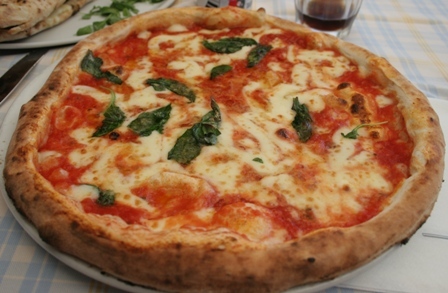 Queen Margherita wanted to sample the cities delicacy after supposedly hearing about it in some royal recount. (Are you getting that feeling they were a bit high class this lot?) Because she couldn't enter the city, they sent the "best" pizza chef, Don Raffaele and his wife Donna Rosa - who was actually the chef - to prepare a pizza fit for a queen. And thus the colours of the italian flag were used. Red = tomato, White = Mozzarella, Green = Basil leaves.